We're still moving on with our alphabet theme (even though these letters seem a little sporadic). 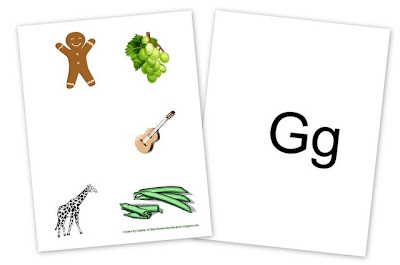 We actually did a lesson on the letter "Q" this week, but just to thoroughly confuse you (really to help me catch up more), I'm going to post about the letter "G". Are you confused yet? :) All the other letters of the alphabet are coming too, but I'm just catching up on these last few and then I'll be right back on track. While the letter "F" page was one of my favorites, this gingerbread man just made me hungry. 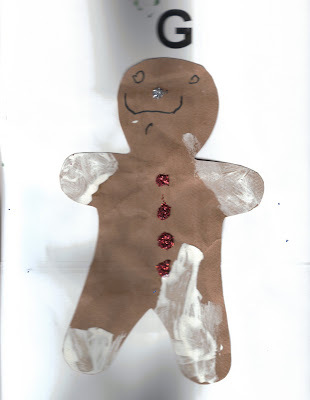 I cut out the gingerbread man shape on a paper bag (remember he is glued to a 8 1/2 x 11 inch paper. 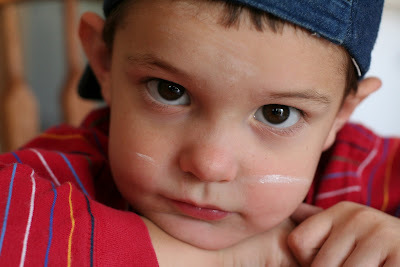 Zachary used white paint that had a little bit of cinnamon scent in it to paint "icing" on his hands and feet. He also drew a face on and then we had fun fighting with the glue bottle so that we didn't have gobs of glue everywhere. Once we had a sufficient LITTLE amount of glue, we sprinkled glitter on for buttons and also a nose. Zachary made a gingerbread baby 'puppet' also to use when we were reading the book "Gingerbread Baby" by Jan Brett (the book is just too cute) - and I'm guessing now that you realize the letter G was mostly focused on gingerbread. I cut out a smaller pattern and he added some googly eyes and drew on a face. Zachary decorated it however he wanted (which meant markers everywhere). When he was done we taped a craft stick to the back and he played with it and made it run around everywhere during the story. For some reason I can't find pictures of the puppet, but I do have pictures of my son after using white paint again. I'd love to meet a mom that truly enjoys her kids using glitter. And by enjoys, I mean - finding it everywhere for days to come after using it. Despite my aversion to glitter, we used it this week. Because glitter starts with the letter "G". As does "glue". Glitter + Glue = Gobs of Gooiness (if that is even a word). And before you think I was crazy foolish enough to make a glittery guitar, you may rest assured I had the glitter far, far away when we did this craft! On one of the ends of the tissue box, trace the end of the paper towel roll and then cut the circle out. Once the circle has been cut out, fit the towel roll into the hole. Depending on how tight the fit is, you may (or may not) have to use tape to secure the roll. Put 4-5 rubber bands around the box long-ways so that they go over the hole in the box. (Listening to your child whine every time a rubber band pops off is optional). Using My ABC Bible Verses by Susan Hunt we learned Mark 16:15 - "Go into all the world and preach the good news to everyone." This week we continued using Peterson's Handwriting. We're doing a lot of gross motor activities right now to learn how letters are formed, so that when we actually sit down with a pencil and paper it will be a lot easier to recall the hand motions needed to make letters. For example, "Tall down" = top to bottom movement. You can read more about Peterson's here. GGGGGGreat! I seriously laughed out loud at your glitter comment and I don't lol a lot (I usually chuckle inside). It is funny, because when I laugh, my whole family comes running to see what was so funny. :-) I would be one that would have the glitter e-v-e-r-y-w-h-e-r-e because I am way too liberal with crafty stuff! We are plugging along with the letter K. Can't wait to get to the letter G - my 8 yo has been begging me to buy glitter, and well, I just need a good excuse! I must be insane because I got excited when I saw G for glitter!!! That is so obvious. Thanks for thinking FOR me. We have completed all our letters and I have been doing some fun testing to see what letters my daughter is not getting.... The letter G will surely be remembered when we drag out the glitter! I also love the sounds and movement ideas.